WT Farley is your source for insufflation yokes, hoses and manifolds for your operating room equipment needs. 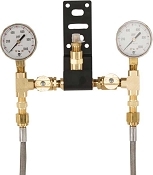 Our line of CO2 products includes CGA specific connections, reinforced metal braided hoses, yoke assemblies with cylinder contents gauge, and dual cylinder manifolds that allow an empty cylinder to be turned off and a full one to be turned on in the middle of a procedure if necessary. 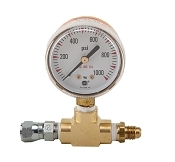 A new addition to our line is an insufflation pigtail that utilizes CO2 from the hospital gas system, not a cylinder. Many different options available. Let us take care of your specific needs!